Sarah first started visiting Point Cabrillo in 2000 as a weekender on the coast, and she began volunteering in 2012 when she retired and moved to South Caspar permanently. 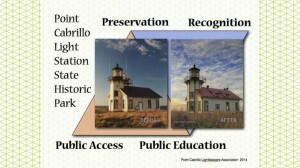 She also serves as a retail docent in the Lighthouse. Prior to her retirement, Sarah served as a program manager in the Office of the Chancellor at the University of California, Berkeley, coordinating the Disaster-Resistant University Project, part of the university’s effort to reduce its vulnerability to earthquake hazards. Before her stint at UC Berkeley, she was a senior planner in the Earthquake Program of the California Office of Emergency Services in Oakland. She is a member of the Earthquake Engineering Research Institute, the professional association for those active in earthquake mitigation activities of all kinds, and edits the institute’s Learning from Earthquakes reconnaissance reports. Sarah began her association with natural hazards at the University of Colorado, working as a graduate student researcher on a multidisciplinary project. In addition to her PCLK volunteer activities, Sarah is also a member of the American Rhododendron Society, the Audubon Society, the Kelley House, and the Mendocino Community Library, and is a supporter of the Mendocino Land Trust.